So, between being the current 'favorite' & where Arthur was, Morgana & Merlin were trying to join him (& not getting the message he was inappropriately trying to deliver). He even crabbed when I talked at them while seeing what was going on. Especially when he heard his name. He was being even worse than Merlin without his evening coffee. He also may be interested in in mating with her too, and she's not receptive to it yet. So when they are mating do they stay connected for a while? Kalili was on Lutana back for a while last night. I mean she continued to eat and sip some water but he was there on her back. I got video of it but don't really want to post that. I have not heard of this degree of behavior for such a long time with no response to bonding. You said you could not remember your previous registration. Where were you located/state. Have you looked through the State Roll Call to see if you perhaps see a familiar registration? If it has been several years since you logged in, it is possible your registration was purged/deleted, however, we have not done that for a long time. 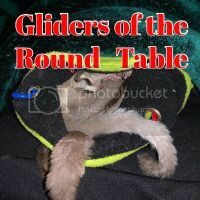 I am going to move this post to Help, I'm New, however, I cannot move it into the Glider Care Forums because you will not be able to reply or post further if I do. Go ahead and register again, and then post under your new display name. That way I can move your post where it best suits. Yes, that was my concerns to have them together, companions but it should be time pretty soon for Joey(s) to start coming out of pouch. I guess depending on the sexes of Joey's (we will keep Joey(s)) we'll have cagemates for both pregnant mom and young Jaz. Thank you so much for everyone's advice. I've been trying to post pics and I'll update when Joey's are here and how everything goes. I have tried to remember but it has not come to me.. if it helps Ziggy is a classic grey, Zelda is Leusistic, and Zoey is a Platinum. Thank you for your help Kimberley. Thank you so much. I've gotten advice to tell him if he's so set on breeding, he can have their blood drawn 😣 and tested to at least get their lineage. I'm hoping discussing this will at least postpone his decision. Please let us know what the vet says. I would take her to the vet for a check up and explain what you found when you came home. Mold can make them very sick. I will be moving this post so please sign up here so you can take full use of the board. And keep us posted on your little one. I would be concerned about the Joey's eye. I would want to make sure he fully recovered from Mom's over grooming. I would also pass on the Joey until he 100% recovers from this and is given a clean bill of health by a vet. I would also be concerned that the Joey may continue to overvgroom himself in the future due to a neurological disorder. Just my thoughts. Being a first time owner, I would want the best for you. If he PMs me his email, I can send him the letter that I sent to the City of Wausau. Such good news. Thank you for the update.